Hundreds of residents could not access their social grants as angry youth in the area protested against nepotism and bribery. 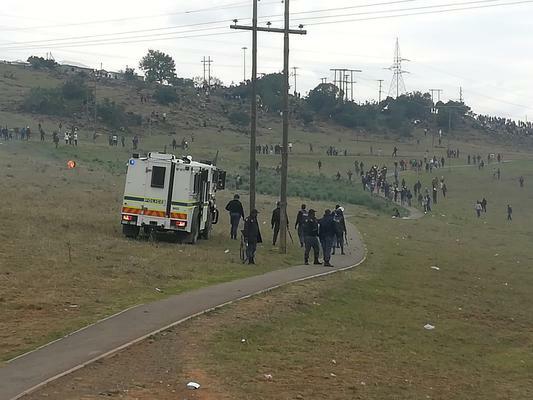 Hundreds of Stutterheim residents from the Mlungisi township were unable to access their social grants payments on Wednesday, due to violent clashes between the police and protesters. Protests entered a second day on Wednesday, following a week break from the protests which began on October 16. Angry Stutterheim youth began protesting accusing Amahtlathi Local Municipality officials of nepotism, taking bribes in exchange for jobs and offering jobs in exchange for sexual favours. They also alleged that the local municipal Mayor Pateka Qaba was not a resident of the the municipality and was offering jobs to people that were coming from outside Amahtlathi. They burned down the buildings owned by the municipalities of Amathole and Amahtlathi, a clinic and caused massive damage to infrastructure. Protests began at 4am on Wednesday, with protesters barricading roads with rocks, woods and burning tyres. Cars could not go through because there is only one route linking Mlungisi township and the town of Stutterheim. Clashes occurred as police moved in to remove the barricades and were pelted with stones by protesters. Police retaliated using teargas, rubber bullets and canisters. Most businesses were closed down in town and in the township as foreign shop owners feared for their businesses to be looted again, although traffic flow on the N6 was not disrupted due to the police’s presence. Stutterheim police spokeswoman Captain Siphokazi Mawisa said two protesters were arrested for charges related to public violence and are expected to appear in the Stutterheim Magistrate’s Court soon. Two weeks ago police arrested 18 protesters – including two minors that were released on warning – while the rest are out on bail. The Amahtlathi Municipality was not immediately available for comment.